From blinds and shutters, to shades, window tint and so much more, American Blinds and Shutters Outlet is your premier Orange City window treatment company. We have been serving homeowners in Orange City for almost 20 years now. Our entire team of professionals are Florida certified and licensed in all areas of window covering that includes custom design, prompt delivery, and full installation of all window products. You can choose from a wide variety authentic shades and shutters, to composite products, and even faux and polycore shutters that are great alternatives to natural wood. With their timeless appeal and filtering qualities, draperies still stand out as one of the most popular window products on the market today. With draperies, the possibilities for decorating your home are endless. You can choose from a wide array of features, styles, patterns, and colors that easily accent any room. 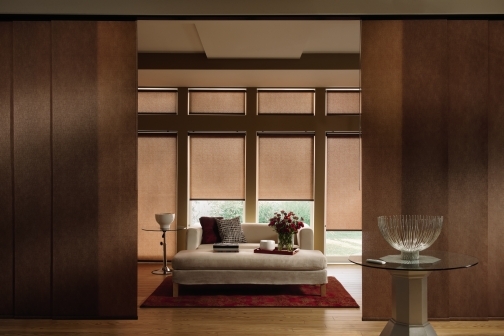 Draperies offer absolute coverage in order to give you maximum privacy and protection from the sunlight and the heat. Draperies can be custom cut to suit any dimension and size, and can easily be implemented into any room. Window tinting provides a completely unique alternative to traditional treatment. There are several distinctive benefits such as great patterns and textures, fine-tuned tones and colors, extremely easy installation and removal, and minimal maintenance. Window tint can act as a supplement to shades, shutters, or blinds, or can stand alone as a great accent to your room. With window tint you can get the same benefits of privacy and protection from the sun and heat, while enjoying a spectacular panoramic view of the outside. For a completely natural look, check out our great selection of woven wood blinds. Woven wood instantly creates a relaxed feel that accents any bathroom, kitchen, and really looks great in your Florida Room. 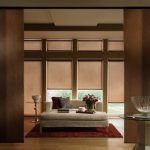 Woven wood blinds allow partial sunlight into the room. This creates a warm environment that gives you a feeling of serenity. They’re made from as reeds, grass, wood, bamboo, and other environmentally friendly materials. All woven wood shades are hand-made for ultra durability. They’re easy to maintain, and easy to clean. Enhance your room environment today with brand new shutters from American Blinds and Shutters Outlet. Natural wood shutters offer sheer elegance with warm tones and earthy colors. You can pick from shutters installed into your window’s framework, exterior shutters, or plantation shutters that are installed inside the home. We carry louvered shutters, plantation shutters, raised panel and even shaker style shutters. Ask us about our wood composite shutters as well! For a completely different type of shutter, we suggest that you discover all the advantages of Polycore shutters. For more information about our Orange City window treatment company, then please call 407-492-1009 or complete our online request form. online request form.